Both passive and active labor market policies are aimed at the unemployed and underemployeed. Passive labor market policies refer to providing financial assistance, like unemployment insurance, to those without job. Active labor market policies refer to some combination of job search assistance, training, and government-subsidized private- or public sector employment. In both areas, the US lags behind other most other high-income countries. Here's an abridged form of a table from the OECD Employment Outlook 2016. 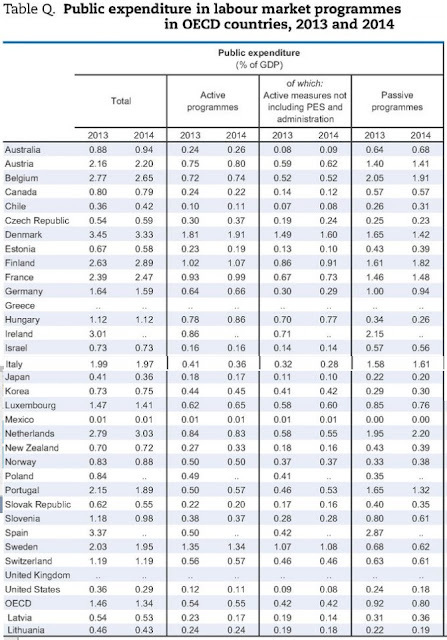 Of course, the amount that countries spend on either active or passive labor market policies will be related to the number of unemployed, so for illustrative purposes it's perhaps useful to focus on 2013, when the US unemployment rate was still in the range of 7-8% and thus more comparable to typical unemployment rates in many European countries. As the graph shows, the OECD average for spending on labor market policies was 1.46% of GDP in 2013; for comparison, the US total was about one-fourth that amount at .36% of GDP. To break this down, the OECD average was that .54% of GDP on active labor market policies and .92% of GDP on passive labor market policies in 2013. The comparable figures for the US were .12% of GDP on active labor market policies and .24% of GDP on passive labor market policies in 2013.
long-term unemployment," which appears as Chapter 2 in the November 2016 VoxEU.org ebook, Long-Term Unemployment After the Great Recession: Causes and Remedies, edited by Samuel Bentolila and Marcel Jansen. As a suggestive set of facts about how such policies might work, consider this figure from Card, Kluve, and Weber. The horizontal axis shows the share of GDP spent on active labor market policies the vertical axis shows long-term unemployment (defined here as being unemployed and looking for work for a year or more) as a share of total unemployment. 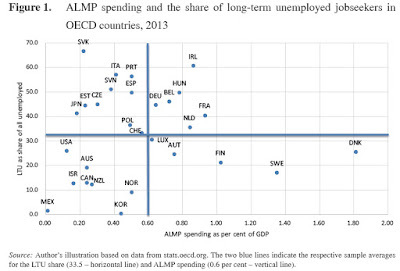 The correlation is far from perfect, and there are a number of countries with less-than-average spending on active labor market policies and less-than-average long-term unemployment as a share of total unemployment. In more specific terms, their summary of the evidence is that such studies have often found positive and statistically significant effects. 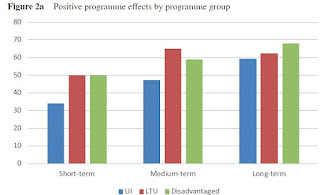 They break down the numbers in a variety of ways, but this figure shows the share of studies in their literature review that found positive effects on three different groups--the short-term unemployed (UI), long-term unemployed (LTU) or the "disadvantaged" who have a low level of educational background or live in an area with few job prospects. The graph shows that about half the studies find positive effects of active labor market policies for these groups in the short run--with the effects being lower for the short-term unemployed--but 60% or more of the studies find positive effects of such policies for all of these groups in the long-term. The full version of the Card, Kluve and Weber literature review is freely available online as a "What Works? A Meta Analysis of RecentActive Labor Market Program Evaluations," published by the German Institute for the Study of Labor (IZA Discussion Paper No. 9236, July 2015). A skeptic might reasonably point out that this glass is also half-empty: that is, a lot of the evaluation studies also didn't find statistically significant effects, and there could be "publication bias" in which studies that don't find an effect are more likely to end up unpublished. My own take would be that there is a sufficient evidence for looking at the kinds of policies that have worked best in other high-income countries, and trying some large-scale experiments with such policies in the US. In Chapter 3 in the VoxEU.org ebook, Lawrence F. Katz, Kory Kroft, Fabian Lange, and Matthew J. "Our reading of the evidence [from literature reviews] ... is that programme effectiveness varies a lot across ALMPs [active labor market policies)and that relatively little is known about what generates this heterogeneity. In particular, little is known whether the heterogeneity is linked to the design of the ALMP or to the treated populations. This reading of the evidence is reinforced by the experimental evidence of the UK Employment Retention and Advancement demonstration (ERA). The ERA experiment covered three different populations, including a group of long-term unemployed. Over the medium term, the treatment was only effective for the long-term unemployed. For the long-term unemployed, the treatment consisted primarily of financial rewards for searching for jobs and for maintaining employment once a job was found. This treatment was found to generate fairly large effects on employment and earnings over the 5-year study period and was found to be cost-effective. The evidence of the ERA thus suggests that financial incentives can help reintegrate the long-term unemployed into the labour market. The ERA however also provides evidence that programme effectiveness varies substantially with the treated population." 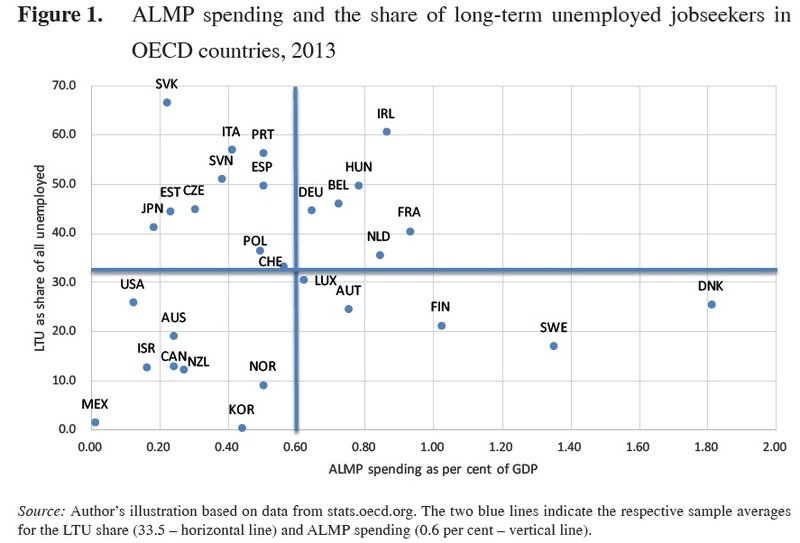 "One speculative possibility, based on the (weak) existing evidence, is to focus on providing unemployment assistance and long-term training to the long-term unemployed in the depths of a downturn, but then move towards more aggressive use of ALMPs, such as job-search assistance and hiring subsidies, to try and re-employ the long-term unemployed, as the labour market tightens in a recovery." It seems to me that the possibility of a dramatic expansion of active labor market policies through aggressive experimentation deserves more attention in the current US economy. Moreover, when US workers express how traumatized they feel by the tectonic changes that are shaking up US labor markets, it's worth contemplating the fact that the US does far less than typical high-income countries either to cushion the shocks or to help in the transition to new jobs. For those interested in this topic, I've posted before about "The Case for Active Labor Market Policies" (December 5, 2011).